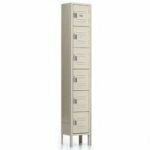 Part of our line of Quick Ship Lockers includes 6-High Box Lockers of various sizes and styles. Our sizes vary from 12″X12″ – 12″X18″ and single lockers to triple-wide. Our Lockers are made from high-quality material from 16-18 gauge steel mounted in welded frame assemblies.